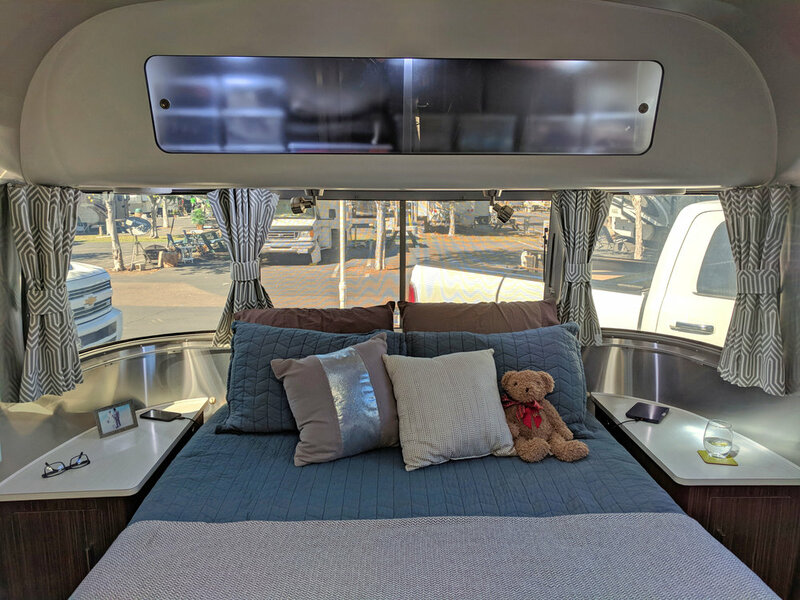 While we were in the US we traveled in a 2014 Airstream International Signature 27FB. Thank you to other Airstreamers who have provided ideas for us. After all, imitation is the sincerest form of flattery. Here's the photo tour of our interior. This is our floorplan. Perfect for two full timers. At the front of the Airstream is our bedroom. We have a walk around queen bed with a pillow top mattress. It's very comfy! Underneath the bed there is considerable storage. Above we store underwear, workout clothes, socks etc. Looking back from the bedroom to the living area. The shower is on the right, it doubles as a place to store laundry! Next to the shower is our closet where we keep the rest of our clothes. The bathroom is on the left. The dinette folds down to create a cozy area for watching movies. We added a magnetic board for spices and to keep the wall clean beside the stove top. The bathroom has a sink and toilet. We added a new countertop, larger above counter sink, and faucet. We added some Smart Tiles (peel & stick), some wall decals and Polaroid picture frames to make the space more interesting. This is our kitchen. We cook everything here or on our outside grill. We have a pantry and lots of storage for all our cooking equipment. Another kitchen shot (with the original countertop) showing showing our fridge freezer opposite the galley. This is where we spend most of our time in the trailer. Working, eating and relaxing. We changed these curtains out too, and replaced the table top with a bright white one. We like to keep our space uncluttered but we have a few trinkets here and there to make the trailer our own.